I ordered two black scroll tables. One for each side of my entry . The sofa tables were exactly what I was looking for . i am very happy with my purchase!! Give your living room, entryway, foyer, or hallway an elegant and traditional flair with this Lorraine sofa table from iNSPIRE Q® Classic. The graceful wood scroll work and visible wood grain create rustic touch that's perfect for any country, vintage, or antique style. With a three-tiered design, you'll have plenty of space for books, magazines, decorative items, and more. Available in several finishes so you can easily pair this sofa table with any existing or preferred color scheme. Enjoy this beautiful piece in your home. 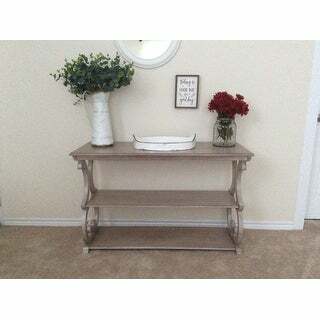 This sofa table makes a stunning statement in my great room behind my sofa. It has a great style that would be compatible with any decor. I love its smooth, antique white finish that is perfectly glazed, without distressed indentations. The top shelf is a few inches deeper than most sofa tables, and has plenty of space for "layering accessories" such as a lamp, picture frames, books, or a floral arrangement. The bottome two shelves are also deep enough for baskets and oversized pottery. This was an amazing find to enhance my decor. Very beautiful charming and unique. 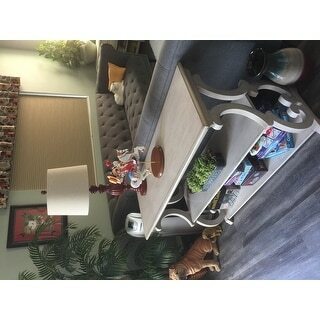 Unfortunately I have to return this Lorraine Wood Scroll TV Stand Sofa Table by iNSPIRE Q Classic simply because eI ran out of room! Sometimes making a purchase over the internet can be a little unsettling since you don't actually get to see it in person first. I scrutinized this item not only on overstocks website but other websites that sold this item as well. 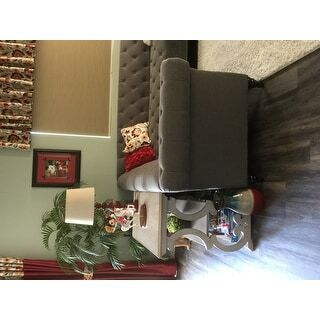 After feeling I was making a confident decision, I purchased from Overstock as they had the best pricing. This was my first purchase from Overstock. The item came in a very reasonable amount of time and after opening the box, I was more than pleased with what I saw. It was way better than I even expected. A very quality piece of furniture. Assembly was easy. Took about an hour and I was able to do it myself without help. 2 of the legs did have slight cracks in them. I called customer service and was well treated over the phone. They fixed my issue by sending new legs in a very short amount of time. My table is all put together now and looks beautiful! Can't wait to put our wooden dolphins from Maui on it. I am not only very happy with my purchase, but I think Overstock has a fabulous customer service and go above and beyond to make sure the customer is happy. I will not hesitate to buy from them again. Thank you. Love it. Green color is perfect for what I wanted. Easy to assemble, everything you need is included in the box. Holds my 55 inch TV and and gaming systems with room to spare on the bottom shelves. I was skeptical bc there were no reviews but so happy I ordered. Very easy to assemble & fits my space perfectly. Exactly what I was looking for and a great price!!!! 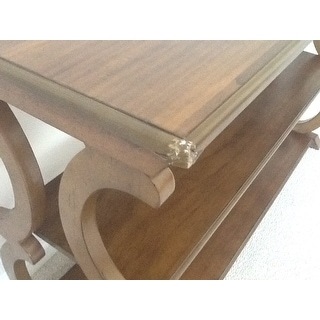 Good quality sofa table; great price. 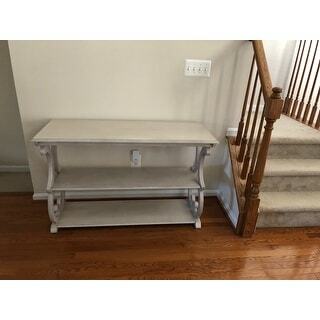 I purchased the Lorraine Wood Scroll TV Stand Sofa Table in Antique White. I absolutely love it! It is the exact color I was looking for to go with the night stands in our master bedroom. It leans toward a grayish white color. It arrived in great shape; very well packed. Easy to assemble with clear instructions; heavy duty and sturdy. I assembled it myself in a short time. I would highly recommend this product to others. This is a great piece. Very easy to put together. We used for a tv stand with baskets underneath on the shelves. Our TV is a 55 inch, and it fit great on this. Just received my sofa table by Lorraine Wood. It is beautiful. Very sturdy. Great size. Love it. Originally wanted the oak finish. 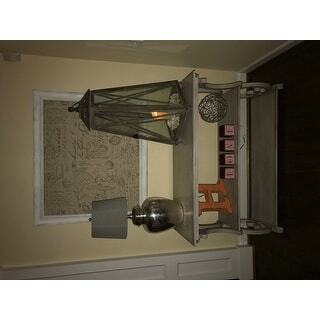 Only color left was the antique sage, but I can work with it. Attractive and easily assembled. Unfortunately, arrived damaged. A corner of the top was crushed. The material was not wood but some type of architectural styrofoam molding. If damage is discovered after assembly it is virtually impossible to remedy. Suppliers only solution is to have you repack and return a 100+ pound item or accept a small monatery credit. 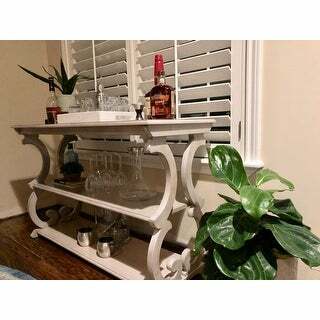 We purchased two of these to use as a coffee bar and a bar in our new smaller home where counter space is tight. They were easy to assemble, but it definitely takes two people to complete the process. We ordered the white color, but in person, they are definitely more of a light gray. Heavy, sturdy tables with nice shelf width and space between shelves. Very heavy piece of furniture. Easy yo assemble. Would recommend to others. The price was great for the quality. 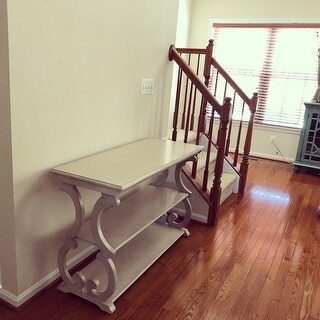 I liked the table but the corner was busted when I got it. Very disappointed. Its a great peiece of furniture but the color was a lot darker than I expected. Took a little time to put together as well. Thought it would have been easier. I would still recommend this product its design is great in my kitchen area. Not really true to color but still a sturdy piece. Just what I wanted looks great! This is one beautiful piece, the picture on line does not give it full justice. The coloring is beautiful, height and size are exactly what I thought I wanted. Thanks Again Overstock. Nice size, very well made and easy to put together. Real wood throughout not laminated covered which was a nice surprise. I've ordered other items that said "wood" and it wasn't. "Would this hold a TV weighing 30 lbs?" Please note this item is not weight tested, however the recommended weight limit for this item would be 30 pounds per shelf. ABSOLUTELY, VERY STURDY AND BEAUTIFUL TO BOOT. I would say yes. We bought this item, and I have to say, it is a very sturdy piece of furniture. "Why can't I choose "black"? It's shown in the pictures, but not listed in the drop down menu." The black is expected to be back in stock in June. "Do you have to install the bottom shelf? The location I want this has an air vent on the floor. 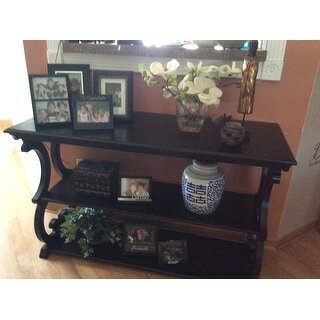 I’m only using it as a entry table with no heavy weight. Are there cut outs for the bottom shelf that will be noticeable?" We recommend assembling this item with all the included shelves for maximum support. To me it’s pretty sturdy but maybe you could just put like a thin piece of wood in the back bottom like from leg to leg ?!?! "When will the antique white be available again?" Please expect this item to be restocked by early August. "How much weight will the middle and bottom shelves hold on this console? Will they hold numerous oversized coffee table books and/or baskets with gym weights etc?" The weight capacity of each shelf is approximately 150-200 pounds. I use this console at the office and quite often there are heavy legal books and files on all shelves. I have not placed gym weights on it, so not sure about that. "are these painted or stained? ready to order but painted wood won't be right for the space..."
These tables are stained with a visible wood grain. It appears stained to me because the wood grain is visible. "How much does this console table weigh?" This console table weighs 59.4 pounds.